The majority of conservatories we build are manufactured in hardwood. Being an extremely versatile material, it is possible to make conservatory roofs of bewildering complexity and window details to match period features or contemporary tastes. 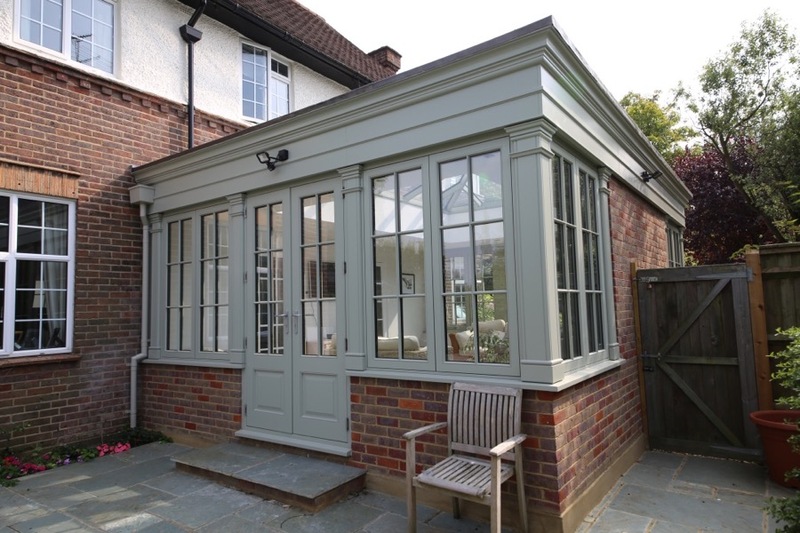 Hardwood conservatories can be painted in any colour, from subtle shades to bold hues. A wide range of stains are also available, all of which allow the natural beauty of the hardwood to show through. Sapele is a durable fine-grained hardwood with excellent strength characteristics. It is a relatively close grained timber, gives a better finish than Meranti, and has similar strength properties to Oak. It grows to a height of around 45 metres, the sapwood is pale yellow or whitish, the heartwood pinkish when freshly cut, darkening to typical mahogany colour of reddish-brown. Sapele is characterised by a marked and regular stripe, particularly pronounced on quarter-sawn surfaces. It has a pronounced cedar-like scent when freshly cut. It is fairly close textured and the grain is interlocked and is harder and heavier than African mahogany, weighing about 640 kg/m³ when dried. In resistance to indentation, bending strength, stiffness, and resistance to shock loads, it is practically equal with English oak. Sapele works well with hand and machine tools, takes screws and nails well, glues satisfactorily, stains readily and takes an excellent polish. For painted conservatories, it is arguable that a cheaper, light timber could be used as the beauty of sapele is hidden away. However any softwood alternative will be prone to structural movement and degradation, cheaper hardwoods with a coarser grain will not give as smooth a paint finish. We use a self-draining glazing system that allows any moisture that penetrates behind the glazing beads to escape, prolonging the life of the double-glazed units. Opening sashes and doors feature with high-performance weather- seals, Saracen high security friction hinges and shoot-bolt locking systems. This comprises a central dead latch and adjustable side bolts operated by the turn of a handle. The handle can be key locked if necessary, both fully closed or in a partially open position. The timber rafters are moulded internally and are arguably the, most attractive feature of a hardwood conservatory. Their size depends on the span, but are generally in the region of 60mm x 120mm. Externally, the rafters are fitted with powder- coated aluminium cappings, normally coloured the same as the timber. This system leaves the outside of the roof maintenance free. Valleys, hips and ridges are produced from larger timber sections and are finished externally with powder-coated aluminium or lead. We can mix any colour whatsoever, however it is normally practical to limit the choice to RAL colours so any ancillary components such as aluminium roof cappings and guttering can be coated to match. All timber sections are fully treated and receive three spray applied factory coats of microporus paint/stain. This enhances the beauty of the natural hardwood, gives long-lasting weather protection, and most importantly allows the wood to breath.